eBAIL is a professional bail bonds company in Las Vegas featuring ONLINE BAIL IN 3 MINUTES OR LESS and also BAIL-BY-PHONE by calling 702-462-9200. Our beautiful office is located at 3100 E. Charleston Suite 108, right on the corner of Charleston and Mojave. The office is surrounded by blooming trees and bushes and it cannot be missed. eBAIL is licensed by the NV Department of Insurance and also accredited by the Better Business Bureau. We also work with the best attorneys in town and provide confidential and fast bail bond services for their clients. When it comes to professionalism and fast service there is nobody that can compare to us. You will be happy in choosing eBAIL for your bail bond needs, guaranteed. 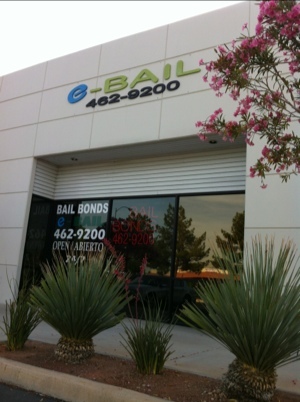 eBAIL offers fast bail bonds in Las Vegas as well as Summerlin, Green Valley, Spring Valley, Henderson and North Las Vegas. Main entrance of eBAIL is facing Charleston Blvd. The office is really bright at night with all the lights in the parking lot and neon. eBAIL is an Online Bail Bonds Company located in the heart of the world famous Sin City. eBAIL assists with getting detainees released from the Clark County Detention Center, Las Vegas Jail, North Las Vegas Jail and the Henderson Detention Center. For bail info please call 702-462-9200.